This is recognised by HMRC as being a ‘significant energy saving measure’ which enables us to charge VAT at the reduced rate of 5%. Dust, draughts and rattles are totally eliminated, whatever the weather. Windows will open and close smoothly and securely. Windows can be easily removed from the inside in order to decorate. Windows are left with new, high quality cords and beading. All loose putty is replaced with new. Flaking paint is removed and any bare wood is primed. U shaped section screwed into original parting bead groove. Detachable pile carrier snapped into U section to allow removal of sashes. Grooves routed to sash mid rail and bottom rail. Draught-proofing pile (weatherstripping) is selected to suit varying widths of gaps. Existing staff bead replaced by new staff bead incorporating the draught-proofing pile. Painted with acrylic white primer conforming to BS 5082. Fitted with brass screws for easy release. Note 1) – All Weatherstripping is selected to suit varying widths of gaps. It meets all requirements of BS 7386 Specification for Draughtstrips for draught control of existing doors and windows in housing. It is also silicone treated to repel water and is ultra violet stabilised. 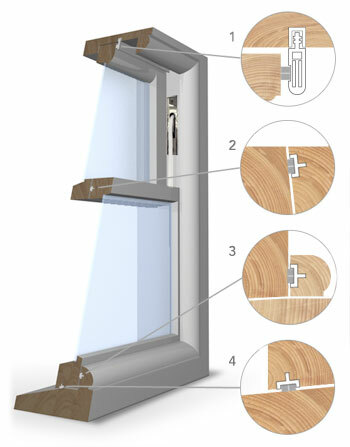 Note 2) – The windows will be left easily removable from the new, high quality sash cords. The sashes will be left perfectly counter-weighted and any extra lead required for this will be supplied free of charge. A draught-proofing system such as ours is automatically approved and often suggested by Conservation Officers as it does not ‘alter the character’ of the window. However, if you live in a listed building or in a conservation area you should contact your Conservation Officer for specific advice if you plan to change the character of your property. This would include replacing your windows.